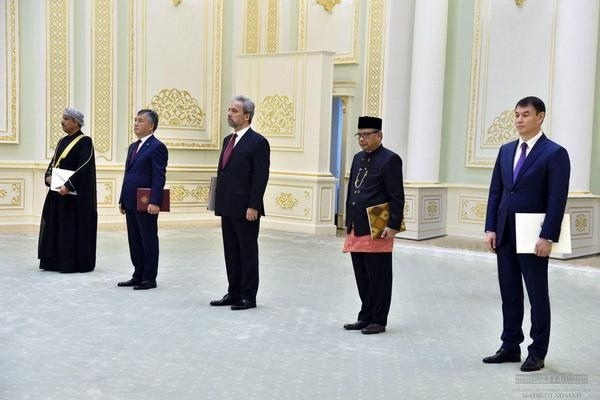 AKIPRESS.COM - On 12 April 2019, President of the Republic of Uzbekistan Shavkat Mirziyoyev received credentials from the newly appointed Ambassadors Extraordinary and Plenipotentiary – Ahmad bin Said Al-Kasiri of the Sultanate of Oman, Ibragim Junusov of the Kyrgyz Republic, Mehmet Sureyya Er of the Republic of Turkey, Sunario Kartadinata of the Republic of Indonesia, and Darkhan Satybaldy of the Republic of Kazakhstan. The Head of the state sincerely congratulated the ambassadors and wished them success in carrying out their responsible diplomatic mission, Uzbek president's office said. It was noted that in Uzbekistan today, within the framework of the country’s Development Strategy, extensive reforms are being undertaken in all walks of public life designed to build a democratic state and shape a strong civil society, modernize and liberalize the economy sectors. In particular, under implementation is the National Program adopted in connection with the announcement of 2019 as the Year of Active Investments and Social Development. Uzbekistan’s foreign policy has been undergoing cardinal transformation, too. The country is perceived in the international arena today as an open, responsible and reliable partner.